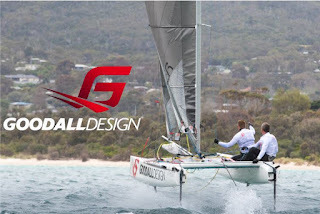 Goodall Design Viper Foiler: J or Z? they were preparing a foiling version, along a hull redesign (deck/bow mostly), of their successful Viper F16. Today this pic was published in GD Fb, and it has a catch or at least it was intentionally selected in my view. The prototypes were tested with TNZ Js (3pt foiling) and this pics shows 4 foils down, but looking closer those are Js a la FP/F20. Wonder if Goodall has recalculated on the Nacra 17 & Essentiel 4pt foiling option or they might stick to the original J/V foil plan. In any case a new production foiler will be available sooner or later from the builders of the World Champ designs (and built quality we can add) C2 F18 & Viper F16.